Are you right up to speed on the towing regulations, and your obligations when towing a horsefloat? Neil Clarkson seeks some answers. The rumours circulated at dizzying speed. You will no longer be able to tow a horsefloat with a car; only four-wheel-drives will be legal with a two-horse float; the regulations are getting so tough that even some four-wheel-drives won't be up to the job. Not so long ago, the rumour mill would have us believe that the horse float was on its way to extinction. Today, the rumours have run out of steam. However, the obligations imposed on those pulling a light trailer - and that includes a horsefloat - are strict, and specific. Have you ensured you're meeting all requirements on the road? Horsefloats are classified as light trailers. Horse floats will normally fall into the TB class - that is, a trailer with maximum loaded weight of between between 0.75 tonnes and 3.5 tonnes. The manufacturer of the float will normally specify this weight, which is technically referred to as the maximum gross vehicle mass. 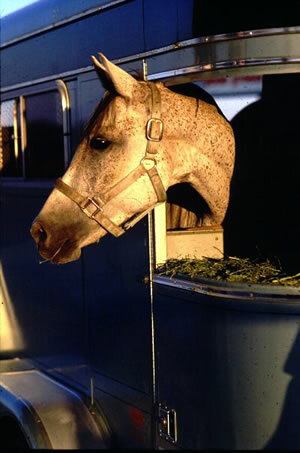 Your local weigh station or rubbish transfer station may allow you to weigh in with your horses on board. My local rubbish transfer station charges a few dollars for the privilege. To ensure that it is within the float manufacturer's requirements. To work out whether it is legally within the parameters of the towing vehicle. Before we deal with towing weight, the braking issue needs to be addressed. There is one essential braking requirement for all vehicles towing a trailer: it must be able to stop from 30kmh within 7m. This applies whether your float has brakes fitted, or not. If you're pulling only one horse in a tandem float, always put the animal on the right (centreline) wide of the float. If you're loading two horses, put the bigger animal on the right (centreline) side. Moving horses can cause the float to sway, and this will have an impact on your braking ability. Did you know that some bigger vehicles once restricted to 80kmh can now go faster? This will explain why some trucks might end up tailgating you on the open road. The speed limit for horse float and other light trailers has increased to 90kmh. It is important that those towing pull over wherever reasonably possible to allow faster traffic to pass. If you borrow or hire a float, it is the driver's responsibility - not the owner's - to ensure that the float is safe and meets all legal requirements. Be careful. Check that the coupling is in good order and that there is no chance of the float lifting off. Brakes are mandatory on trailers with a laden weight greater than 2000kg, which will cover most tandem horse floats. It is unlikely any unbraked two-horse float will pass the 7m test, no matter how good the brakes of the towing vehicle. Towing weights are given for braked and unbraked trailers. They can vary between automatic and manual transmissions within the same model. Sometimes, manufacturers might specify tow coupling positions required to meet the towing maximums. The limits given assume that the brakes of the vehicle and the trailer - where fitted - are in good working order. It is important to remember that even if you meet the load requirements of your vehicle manufacturer, you are still required to be able to stop from 30kmh within 7m. Your float's lighting is looked at during its warrant of fitness, so we won't go into detail here. However, it is important that you understand the situation with towballs. If you have a problem, your warrant garage should already have brought it to your attention, and resolved it. However, it always pays to check. There are two sizes for tow balls: the old 1 & 7/8ths of an inch, which has a diameter of 47.5mm, and the newer 50mm ball. Drivers need to be very careful to use matching couplings, as there is a risk they can come apart if they do not match. Some couplings are designed to deal with both ball sizes. Really, you should not, for safety's sake, mix and match these couplings under any circumstances. Your ball and coupling should be marked clearly. If you're in any doubt, get your garage to check it out. In terms of overall dimensions for your float, some of these can only be checked when your float is attached to your towing vehicle. Hook it up and check it against this diagram from the Land Transport Safety Authority. It is also important that you can complete a 360degree turn within a 25m circle. While doing this, no part of the float or vehicle may touch, apart from the coupling. From February 27, 2005 the new "Road User" Rule took effect. All drivers towing other vehicles must ensure the brake connection between vehicles are correctly connected so that the brakes of towing and towed vehicles operate as intended. (this links with equipment requirements in the Heavy Vehicles Rule).